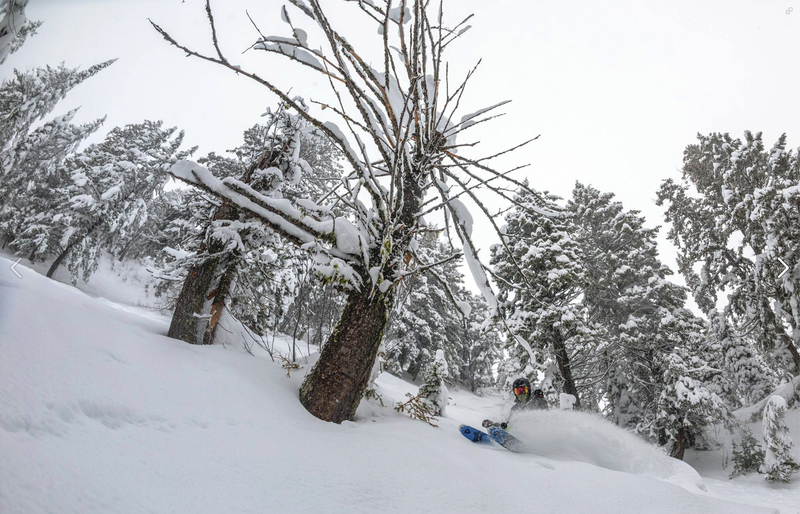 Freeskiing is a word used to describe the form of skiing where the rider uses natural features and the raw landscape to enhance and diversify their run. I was introduced to the word back in 2006 when my home mountain Fernie Alpine Resort hosted its first junior freeski event. An event that changed and shaped my life into what it is now. Back then the word to me was focused on the competitive side of the sport. Now, ten years later and having attended close to fifty freeride events the word means a lot more then being a competitive big mountain skier. After all these years where competitions have dominated my winters, I came to appreciate the true meaning of freeskiing this past week in Revelstoke, who was hosting the first big mountain competition of the season. It was the night before the first day of the competition and as I entered Guest Services at Revelstoke Mountain Resort I could feel the energy in the room. With over one hundred athletes gathered to sign in for the event, the vibe was hard to ignore; I sensed that everyone was eager, excited and nervous for the days to come. I walked to the registration table and gave them my name. “Yeah, you’re going to have to talk to Ben.” I waited as the event director Ben tried to figure out what was wrong, I was confident that I was in the system but as time went on something did not feel right. “What’s wrong?” Asked a girl at my side. Jess is a Kiwi living in Fernie for the season and we had only met the day before. She is competing in Canada this year and was looking to jump into a car with another competitor. In these high stress situations of travelling and competing even close friends can get tired of each other. It was a bit of a gamble letting someone I had never met into my space for the week but I do find it important to travel with other competitors so you can share the weight on the competition. You can also express your line choices and bounce ideas off of each other. When Jess pushed me over in the parking lot as I was doing up my boots I knew we were going to get along. “I am not on their list, but I received a confirmation email. Head up to the meeting, I will see you there.” Jess was registered and given a pass so she could load the gondola that would bring her to the Revelation Lodge where there was a welcome dinner and a mandatory athlete meeting. As I waited, I decided to look for the email that I glanced over after I registered for the event over a month ago. When I found it I couldn’t believe the mistake I made. It was a confirmation that the IFSA had accepted my request to be in the event…and that I was on the wait list until further notice. I was reading this when Ben pulled up the wait list and broke the news to me. I was 19th on the list and there were four others in front of me. Chances are I would not be competing. I was “gutted” as my Kiwi companion would say, but I hadn’t given up hope yet. Jeff Holden is the head judge of this event and has been judging me since that first competition in 2006. All these years he has been a friend and mentor to me. If anyone could pull some strings for me it would be Jeff. I listened to the other athletes speak amongst each other. They were talking about the venues and cold temperatures. My inner voice was busy yelling at myself so I sat in what appeared to be silence. When we reached the mid station I bolted out the door and headed down to the glowing lights that illuminated from the Revelation Lodge. I welcomed the warmth of the building and the smell of the food. Revelstoke is the only event I’ve been to where they have dinner for the athletes, and being a traveling ski bum, a free meal almost beats a couch to sleep on. I walked past the buffet, looked around the room and finally spotted Jeff. I ran over and explained the mess I had created. He said he would see what he could do. It was not his call to make so I hung around, and yes, I ate some food even though it was technically for the athletes, which I was not, but I’m still a ski bum after all. During the classic Jeff Holden athlete meeting with Jeff beatboxing and rallying the crowd Ben announced that the start list would be ready shortly. At this point I knew I would not be competing. I sat there thinking about the three bald eagles we saw the day before wondering why I was supposed to be there. I knew there was a reason, but this one was just not apparent to me yet. The eagles were a sure sign of good things to come so I stayed positive and patient. After the meeting they confirmed that there were too many athletes to let me in so I suggested I could be the fore-runner and they accepted my offer. The fore-runner is the first one to ski the venue allowing the judges to put their pens to paper before the first competitor. Jeff reminded me the main job of the fore-runner and we stood around and laughed at the ridiculous mistake I had made. It felt good to laugh even though I was choked. I awoke that night wondering if the grief I felt was the feelings of a bad dream, but no the feelings were real. I needed to find a way to make the most of this trip. The next day Jess and I woke to an incredible sunrise, the pink and orange sky was glowing above the Gold Range of the Monashees and I stood and observed the famous Mt. Begbie from our balcony at the Sutton Place Hotel. It was a new day, already beautiful, and I was eager to see what else it would bring. Then the starter counts you in. “Dropping in 3…2…1…” Everything falls away at this point, the stress vanishes and your tired legs are now pumped, adrenaline has taken over. You are so focused that almost all of your thoughts are forgotten by the time you get to the bottom. Have you ever blacked out from adrenaline? I highly recommend it. It is a challenge to ski your run exactly how you planned, but the feeling you get when you nail your line is one of, if not the best feeling I have experienced. My hands go numb and tingle with adrenaline, the crowd yells and so do your fellow athletes as they welcome you into the finish corral. My experience this time was a bit different. Being the first one down the slope, there was no crowd at the bottom and no other athletes watching. The only people that saw my run were the judges and the announcer who said, “If that was just the fore-runner, today is going to be insane!” And that was it, the comp for me was over, but without knowing it, my week was just about to begin. As I stood at the bottom of the venue trying to decide what to do next I saw the familiar face of CJ Wright. I thought about CJ the day before as I was skiing around the resort. 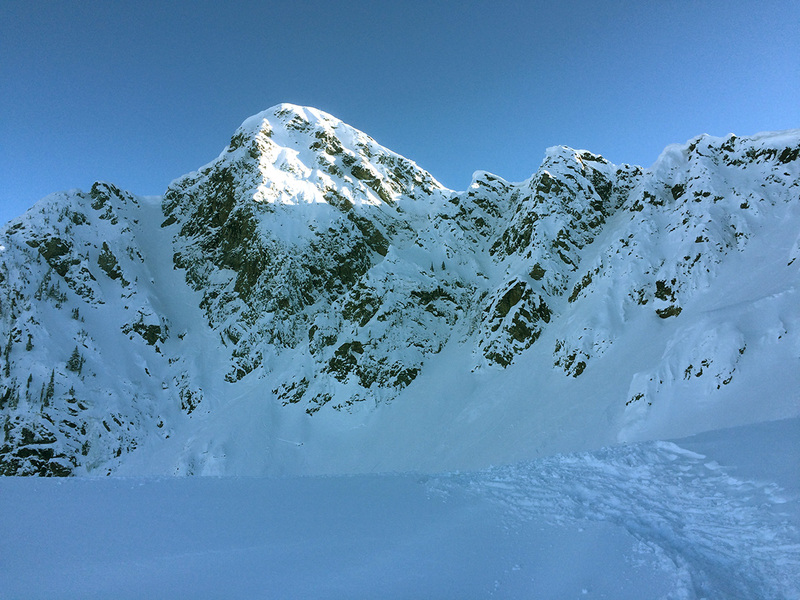 I spotted a classic couloir I have always wanted to ski among many other lines off of the iconic Mackenzie Peak. A zone where I have seen CJ’s tracks almost every time I come to Revi. CJ and I met years ago at this very event so we stood and caught up a bit. I told him I wanted to feel like I have accomplished something, and the best way to do that is to really scare myself. The next day we checked out of our hotel and made plans to stay with a friend of a friend. His name was Chuck and he was a real beaut. Just like Jess and I had jived, Chuck jived right along with us. I really enjoyed their company. Jess had plans the next day to go on a photo shoot with some competitors she had met. The comp had not gone as planned for her either so she was stoked to also try and make the most of the trip by other means. Meanwhile Chuck was organizing a photo shoot for him and another friend and invited me along. Their goal was to head south from the top of the Stoke Chair to hit Kokanee Bowl during the sunset. At the right time, the snow at that elevation was illuminated in pink light and Chuck was set on being there. We met the photographer Ryan Creary in the parking lot the next morning and made our way to the Revelation Gondola. There we met Marissa Krawczak, a snowboarded from the States who was here for the comp. Once we were on top of the Stoke Chuck pointed to where we were going. He called them The Gun Barrels and like the lines on Mac Face, they spoke to me earlier in the week. They were spines way off in the distance that were calling me. I could not believe that was where we were going. Everything was falling into place. That afternoon we played around in the sunny bowls of South Bowl milking pow shots and jumping off some stuff for the camera. Then as we started the trek to Kokanee Bowl we realized we were late. The pressure was on! We ran up the skin track hoping we could get on top of the before the sun went behind the Monashees. Once we made it to the top, I stumbled over my gear as I was out of breath, rushing to switch over. We made it in the nick of time, we were just starting to loose the light but I think the shots worked out. Who knows, maybe one day a photo from that mission will resurface as one of Ryan’s many published photos. From underneath the dwindling glow of the spines we regrouped and started down the drainage back towards the resort. By the time we got back in bounds it was dark and Ryan warned us about the winch cats. We turned our headlamps on and headed down the groomers, using feel more than sight to make our way. We passed one cat that had made fresh corduroy and again, we hooted and hollered at each other as we carved down the soft fresh groomer all the way to the bottom. That was another day well spent amongst the trees in the mountains. That night was our last night in town, and there was an all you can eat Indian Buffet at the Frontier Restaurant. It was exactly what we needed after a big day. We met Jess and the crew she skied with and we all shared our stoke with each other over massive plates of curry. We all went to bed early that night, Chuck had been on big missions all week and Jess and I were getting up early to hit Rogers Pass. In the morning we left Chuck the last of our bacon and eggs and hit the road. One more ski day then back to Fernie. 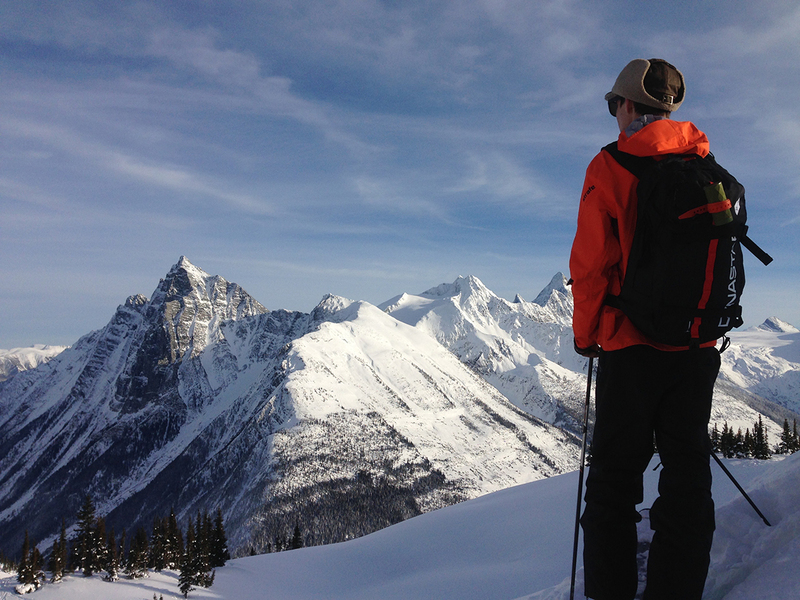 It was another beautiful day in Revelstoke and I was excited to show Jess around Rogers Pass. She told me it was on her bucket which made it an extra special mission. We made it to the top of Grizzly Shoulder and we were both in awe of the view. We sat there in silence and let the events of the entire week soak in. It had been jam packed, and different than either of us had expected. Everything had worked out, actually even better than I could have imagined. As we drove down the pass with the sun setting right in front of us after an amazing untracked run Jess said to me, “I am in such a good place right now.” We were both on the same level, experiencing overwhelming joy like when it snows for the first time of the season. 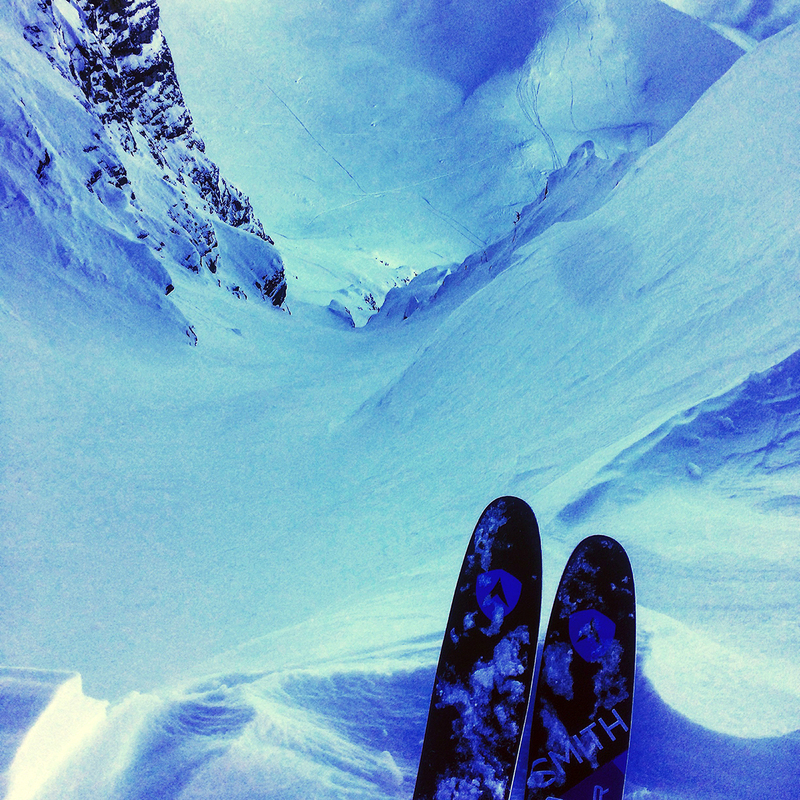 Now that is freeskiing.